In a small bowl, use a fork (or a mini chopper/food processor) and thoroughly mix together the yolks, mayonnaise, mustard, herbs and pepper. Spoon an equal amount into each of the egg halves. Sprinkle with truffle salt. I've recently become a bit of a baroness of truffle salt. Just days after we picked up two jars at a food and wine festival at the National Harbor earlier this month, a tiny jar arrived as part of a large package of spices and things as a thank you for participating the the 80 plates event. YUM. I've been sprinkling truffle salt on quite a number of things: lobster tails (too simple to even need a recipe) and my favorite, scrambled or hard-boiled eggs. Truffles go so well with eggs. I, as you all know, enjoy a deviled egg so of course I need to make one using my new favorite ingredient. The trick is not to be stingy when sprinkling them over the finished egg. You want to get a hit of heavenly truffle in every bite. I know I tend to hoard spices and products I find "special" but I've been trying very hard to actually use them and not let them moulder until some mythical recipe comes to me that I feel are worthy of their use. This recipe is worthy but it is admittedly, on the face of it, a bit of downmarket use of truffle salt. 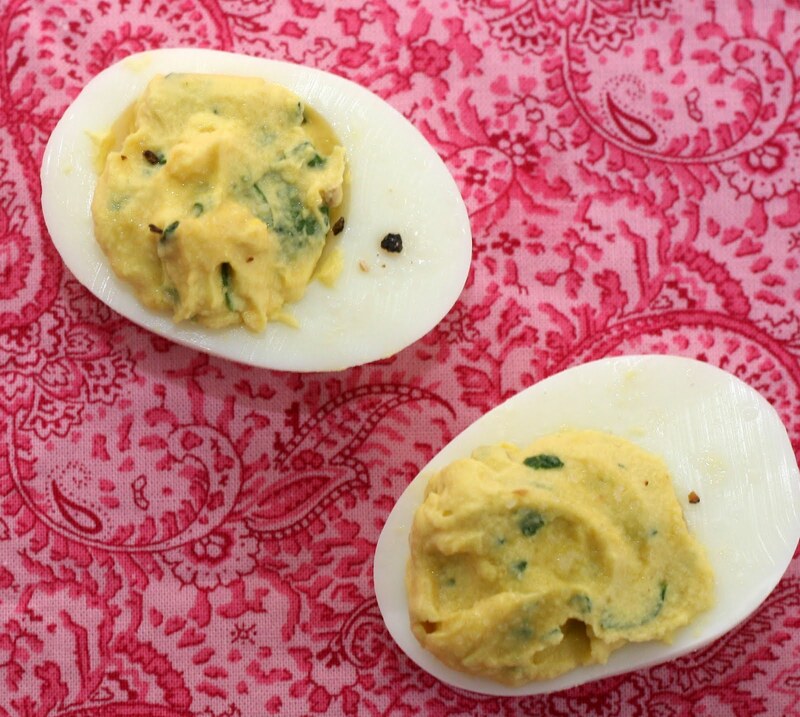 But with the numbers of fancy deviled eggs I've seen on menus, perhaps it is right on target. Saute the chiles, onion and garlic in a 12-inch cast iron skillet. When the onions are translucent, add the tomatoes, chickpeas and spices. Stir. Cook until the mixture has thickened. Create 6 small, shallow wells in the tomato mixture. Crack an egg into each one. Cover and simmer until the eggs are set, about 5 minutes. Serve with pita or crusty bread. 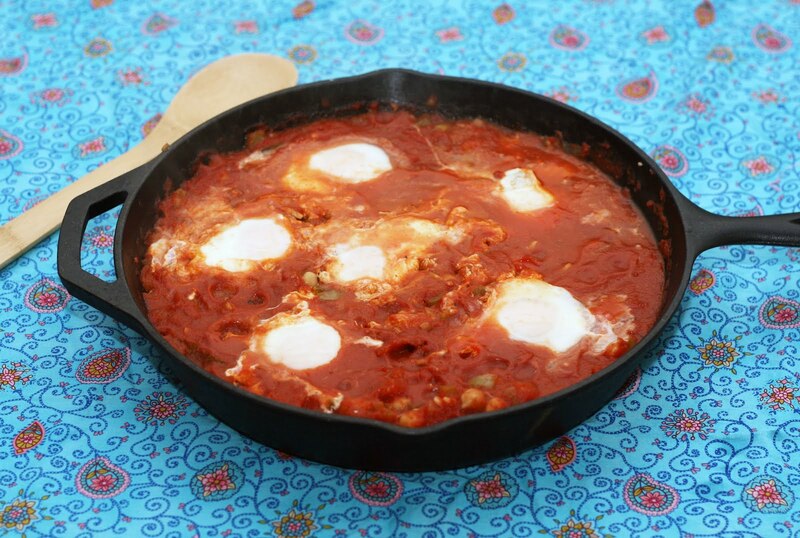 Bravo's “Around the World in 80 Plates”was taking place in Marrakesh, Morocco this week (May 30th, 10/9c) I thought it would be a good excuse to make shakshuka. While it is (some would say, arguably) originating out of Israel, it is also a very popular dish in Marrakesh. There are tons of variations but I went pretty traditional but using American Anaheim chiles which added a lovely, lingering spiciness and pinch of this Marrakesh n.6 spice by La Boîte á Epice rather than creating my own spice blend. While doing my research into the food of Marrakesh, I noticed that shakshuka with chickpeas showed up on on many menus so I added them in. I am glad I did, it made the dish much more of a full meal. Try it for breakfast or brunch. Check out the "80 Plates" Facebook page and see pictures of what other bloggers are making. Coconut & Lime's 8th Blogiversary! Back in 2004, I posted my first recipe. Who would have thought that in 2012, I'd still be here? 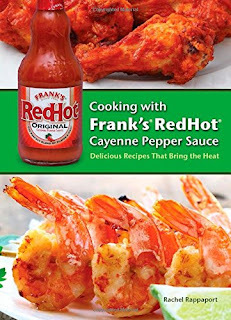 It has been nearly 1,400 recipes of my own creation and two cookbooks each featuring 300 never-before-seen recipes (Everything Healthy Slow Cooker Cookbook and the Everything Whole Foods Cookbook)and I am still going strong. Over the years I have cut back to three recipes a week vs. a new recipe every other day but I still enjoy posting recipes and sharing them all with you! Thanks for reading! 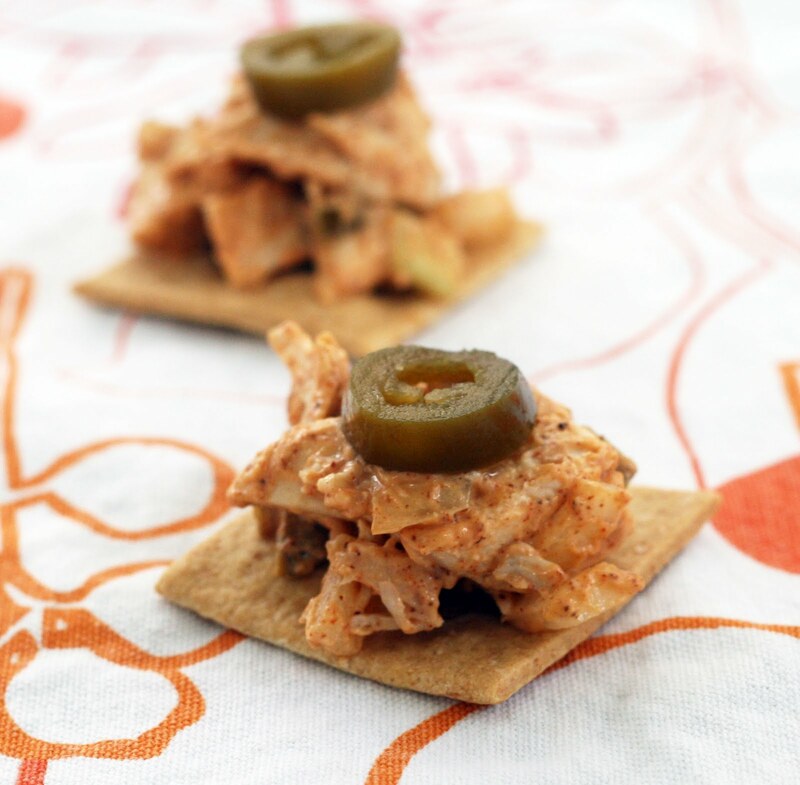 In a medium bowl, toss together the jalapenos, onion and chicken. Set aside. In a small bowl, whisk together the spices and mayonnaise. Drizzle over the chicken mixture. Toss to coat. My husband likes to make these rice cooker dishes to take in his lunches during the week. Some times he uses leftovers from other meals that we've made but if we don't have anything on hand, he picks up a rotisserie chicken from the grocery. Which generally are pretty good (although, there does seem to be a wider range of tastiness than one might think) but sometimes yield too much for his lunch. So then I get the leftovers to play with. He normally uses all of the dark meat leaving me with at least a little bit of the breast. Perfect for a quick chicken salad for my lunch! I was feeling spicy so I loaded the dressing up with ground chiles and instead of the more typical (cucumber) pickle, I diced up some pickled jalapenos instead. It was wonderful! It added the pickle-y note I like but some heat as well. I had it on crackers but I bet it would be great on a sandwich as well. Heat one cup of the stock and seep the saffron. Set aside. Heat the oil in a 14-inch cast iron skillet and saute the garlic, onion and chorizo until the onion is translucent. Add the tomatoes and peppers and cook until most of the liquid has evaporated. Meanwhile, sprinkle the catfish with a small amount of the smoked paprika and cook, until nearly but not quite through, in a nonstick pan. Remove the fish from heat. Add the rice to the tomato-chorizo mixture and cook 1 minute, stirring constantly. Add the stock, the saffron stock, remaining paprika, salt and pepper. Simmer for 10 minutes without stirring. After 10 minutes the rice should start to rise to the top and puff up. Add the artichoke hearts, catfish, shrimp and scallops. Cover. Cook about 10 more minutes or until there is nearly no liquid left in the pan. Add the peas and parsley. Cook 1-2 minutes or until the peas are bright green and cooked. A slight crackling sound means a thin layer of crispy rice is forming, it is the socarrat and this is a good thing! Remove the rice before it burns or worse, if it starts to look like it is heading towards becoming mushy. Serve. 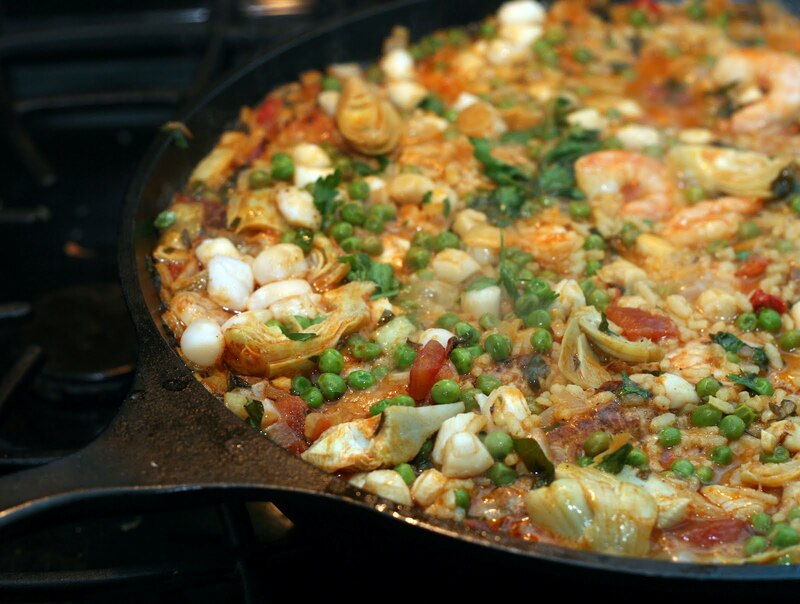 Whenever I think of paella, I am reminded of the Hamish Macbeth episode when the McLopez clan is in jail and keep asking for "pie-yella" to be served in keeping with their Spanish-Scottish heritage. Thankfully, I also think of a tasty rice dish, one that hopefully includes socarrat, the crispy bottom layer of the pan. Despite having nearly every kind of small kitchen appliance and pan know to man and womankind, I do not have an official paella pan. This is due in no small part to the fact that I until I made this, had never actually made paella before. But we had two other couples coming to dinner and I thought I'd give it a shot. Luckily, a cast iron skillet is more than up to the task. It is a bit of a task to track down all of the ingredients. Our local Italian store sells Spanish chorizo so that was easy but finding the official Bomba rice was trickier. Luckily, I found it at one of the two Wegmans that are roughly in our area. Saffron was ordered online. I made the shrimp stock the week before and froze it. Now I did take a short cut and used high quality jarred roasted peppers. Feel free to make your own but it seemed like the quickest thing to cut with the littlest effect on the final product. 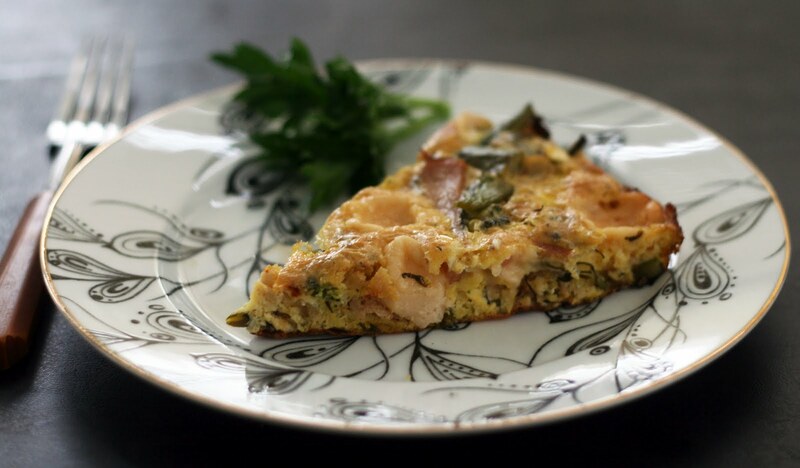 The end result is a relatively easy yet very, very impressive looking dish to serve guests. 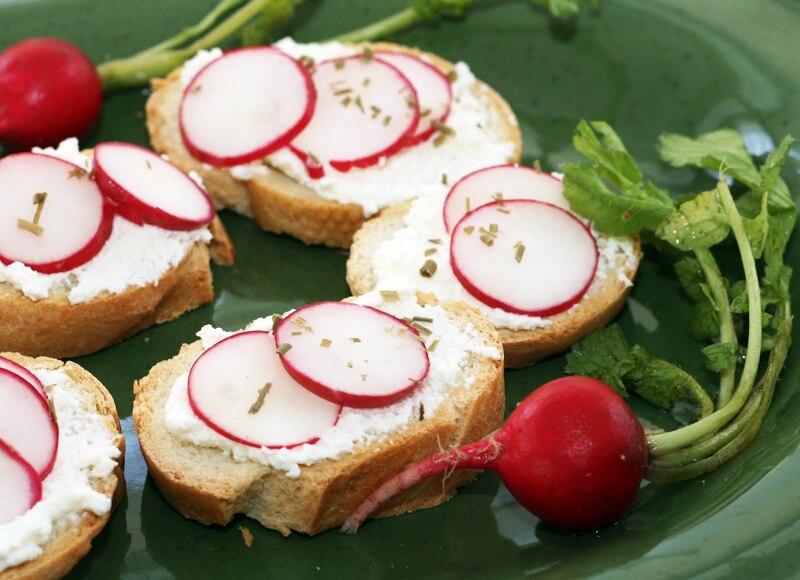 Try serving tapas-style snacks before hand but don't let anyone fill up! No one wants to miss out on this very most Spanish of dishes. 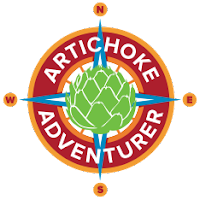 I'm part of a small group of bloggers who are posting regional dishes as part of Bravo's “Around the World in 80 Plates”. The show features chefs from all over the US racing through cities across the country and taking over restaurants to serve their version of the native cuisine. This week's show takes place in Barcelona, Spain. Tune in on May 23th, 10/9c. Check out their Facebook page and see pictures of what other bloggers are up to and to learn more about the show. Preheat oven to 325. In a 12 inch cast iron skillet, heat oil and butter. When hot, saute the broccolini and onions until the onions are translucent. Add the Canadian bacon and saute just until it is warmed through. Whisk the spices and mustard into the eggs. Pour over the broccolini mixture. Evenly distribute the cheese over the egg. 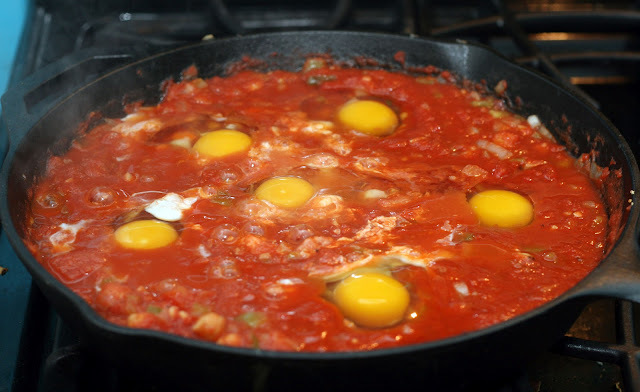 Tilt the skillet slightly and turn to coat the ingredients in the skillet with the egg mixture. Keep on medium heat and cook until just beginning to set. Place in the oven about 10 minutes or until the top is just beginning to brown. Check to make sure it is fully cooked by sticking it with a thin knife. Remove from pan and slice. *My Canadian bacon slices were on the large yet thin side. Some brands may have thicker/smaller slices. If so, feel free to use more or less bacon. I always like finding broccolini at the grocery store. While I like broccoli, it is a little large and robust for everything I'd like to use it in. Broccolini is a cross between broccoli and gai-lan (Chinese broccoli) so it has that broccoli-like flavor but is smaller and tender. Perfect for dishes like this one. Canadian bacon was my go-to for the meat because of its smoky flavor which I thought would pair well with the broccolini. I chose the Parmesan for the same reason. I needed a fairly robust cheese to stand up to the other flavors. I used these pre-cubed Parmesan "nuggets" from Piacci which I liked a lot. It made the dish a lot easier to put together but it was still a very tasty cheese (unlike many pre-cubed cheeses I've encountered). They just melted right into the frittata while it was in the oven, forming the best little cheese pockets. Yum. Spray a skillet with nonstick spray. Quickly saute the meat and vegetables until the meat is just barely cooked on all sides. Add to a 4 quart slow cooker. Stir. 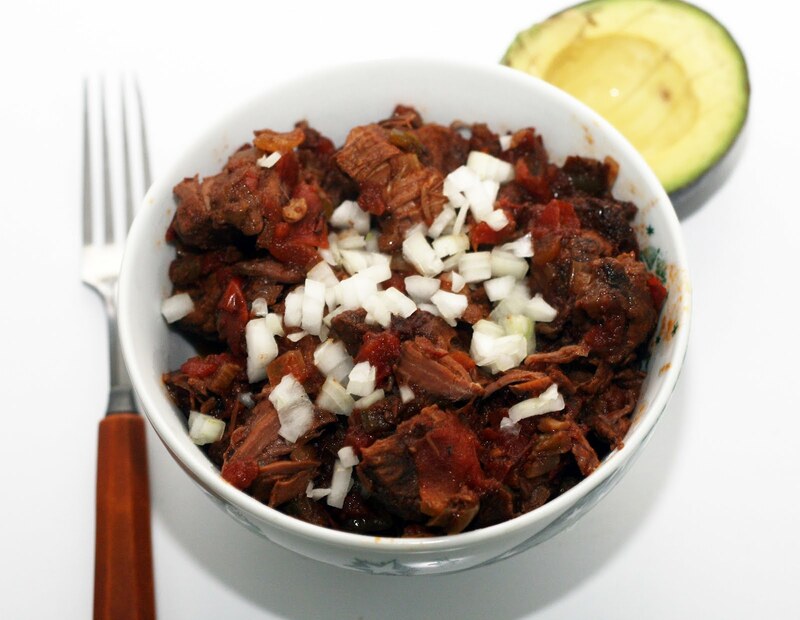 In a small bowl, stir together the chipotles in adobe, tomatoes and spices. Pour over the meat mixture. Stir to evenly combine. Cook on low 7-8 hrs and then high until ready to serve (up to 2 hours). Stir prior to serving. For some reason, I've been in a chili mood lately. It isn't something I eat or want to eat all the time but then I do want to, I want it now! When I saw a good deal on beef at the store I figured it was a sign. I brought it home and prepped the veggies so I could just pop in a a pan and then the slow cooker the next day. I can make chili on the stovetop but between working on a new big (top secret!) project and my husband taking up kung fu, I've been using the slow cooker more and more lately so I don't have to start cooking (often, again) so late in the day. Luckily, since writing 300 slow cooker recipes for my first book, I think I could make something for the slow cooker in my sleep. Or possibly as a zombie. I do think the slow cooker makes good chili. Cooking large chunks of beef takes forever on the stovetop and honestly, I think I get better results in the slow cooker. The meat always ends up falling apart tender and I don't have to keep stirring to keep it from burning. For this chili I used up some chiles I had on hand and a can of chipotles in adobe. I was going to put beans in it but I realize we did not have any beans in the house besides chickpeas (and we had a million of those. No clue why. We never eat them) and I thought that would be weird. I don't think I've ever been without beans before. Normally I stockpile them like crazy but I guess I used up my last can without noticing. Despite the crazy amount of chipotle in the chili, it actually isn't very spicy, just very well and deeply flavored. Slice the loaf in half longways. Scoop out some of the middle of the bottom half to form a sort of trough. Discard the insides (or nibble). Brush both sides of the bread with olive oil. 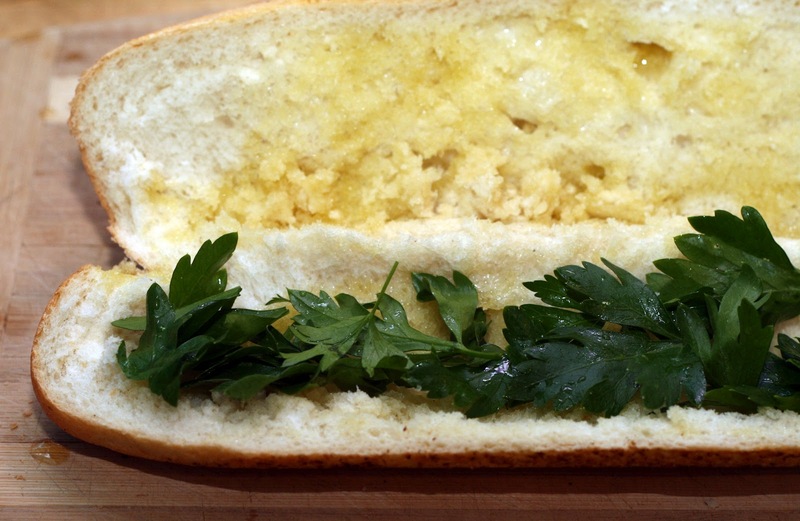 Rub with the clove of garlic. Line the trough with parsley. Set aside. Chop any remaining parsley. In a medium bowl, mix together the tuna, artichoke hearts, olives, anchovy, chopped parsley, onion, lemon juice, salt and pepper. Fill the trough with the tuna mixture. Top with green beans. Close the sandwich. 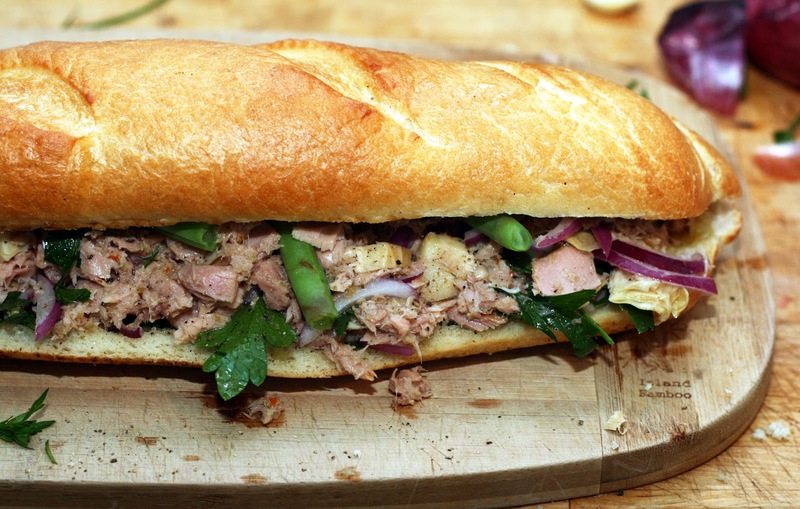 Wrap the sandwich very tightly in foil, waxed paper or plastic wrap. Weight it down with a large cast iron skillet overnight**. Cut the sandwich in half. Take a bite. Pretend you are in the French countryside. *Take care to buy a wider, fatter loaf so there is plenty of room for the filling. **I don't see any need to refrigerate this sandwich overnight because everything is safe at room temperature. However, if you do want to refrigerate it and cannot fit it and your cast iron skillet into the fridge, press it for a few hours then refrigerate. Allow to come to room temperature prior to serving. This is a wonderful, French twist on lunch. 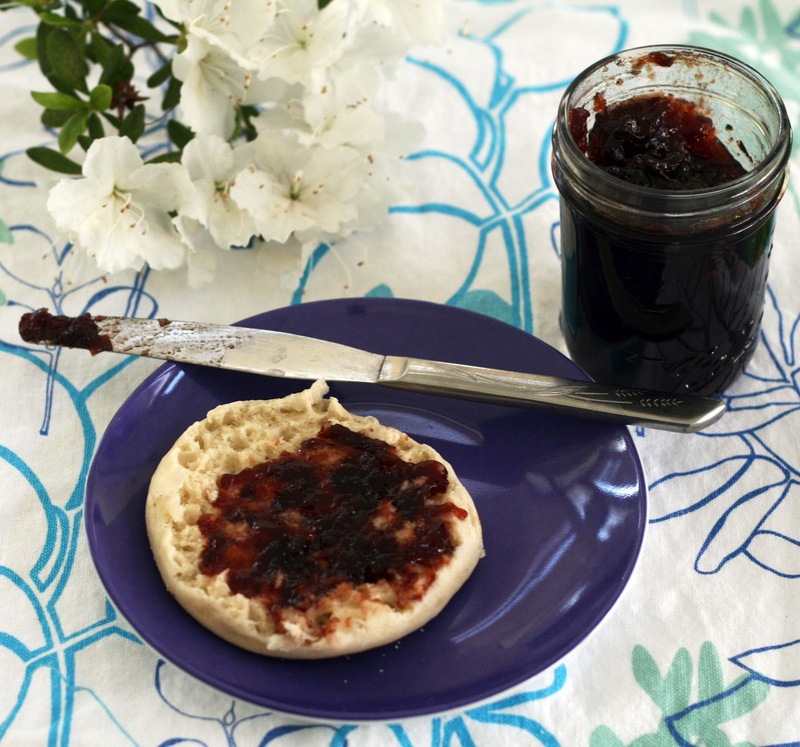 It is the perfect thing to take on a picnic or to work because not only is is dead simple to make, one makes it the night before. No work required the next day at all! 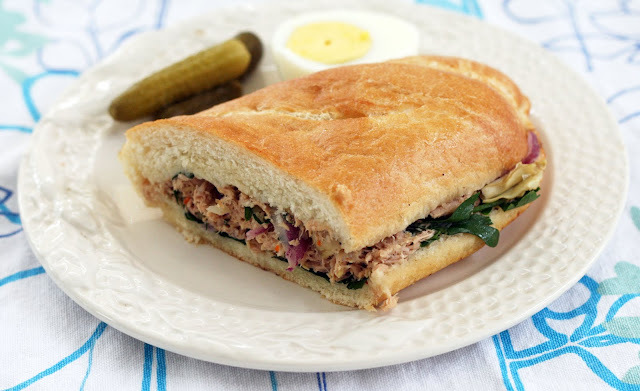 There are a lot of variations on pan bagnat, which is basically Salade Niçoise in sandwich form. Some recipes call for hard-boiled eggs in the sandwich but I prefer to leave more room for filling and serve with one the side with some cornichons. While you can eat the sandwich right away (I admit to eating some filling with a fork as I made it) it really is better the next day when the flavors have a chance to meld. I'm part of a small group of bloggers who are posting regional dishes as part of Bravo's “Around the World in 80 Plates”. The show features chefs from all over the US racing through cities across the country and taking over restaurants to serve their version of the native cuisine. This week's show takes place in Lyon, France. Tune in on May 16th, 10/9c. 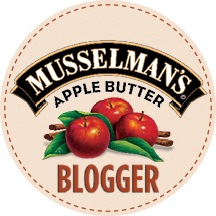 Check out their Facebook page and see pictures of what other bloggers are up to and to learn more about the show. In a skillet, saute the onion and jalapeño until the onion is soft. Remove from the skillet. Set aside. Broil the sausage until browned and cooked through. Set aside and keep warm. In a medium pot, bring the broth to a boil. Add the grits and stir continually for about 10 minutes or until all the broth is absorbed. Remove from the heat and stir in the cheese, salt, pepper and onion. I was in the supermarket the other day and saw grits on the shelf and it looked oddly good. I don't make a lot of grits but I do enjoy them and they have been on my mind lately when planning a trip to the South. We just don't see them on the menu here as often. Shrimp and grits, yes, they are oddly popular but grits for breakfast? Not so much. Then I saw that my husband had put a package of andouille in the cart (it was on sale!) I thought I'd take it from its usual use and turn it into a breakfast sausage to serve with my grits. 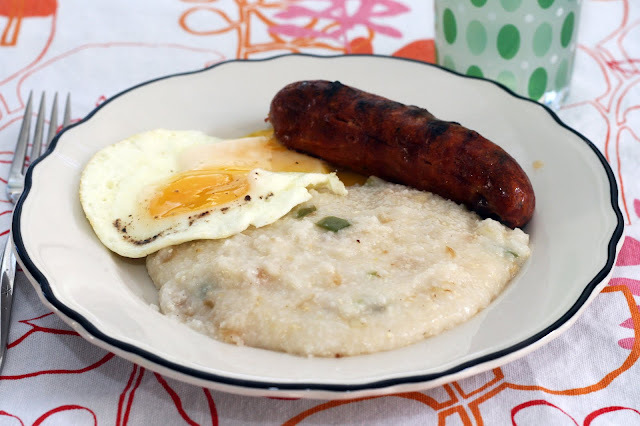 A lot of old time Baltimoreans will eat straight up breakfast (link) sausage and hominy for breakfast so why not grits and andouille? It is just their further south cousins. I added cheese (because I could) and peppers (to tie in with the spicy sausage) and a delicious breakfast was done in about 10 minutes* with little fuss. Perfect for the weekend or weekday and a step up from the usual. *Also: can someone explain to the appeal of quick cooking grits? They only take 10 minutes the "long way". In a nonstick skillet, saute the kielbasa, onion, and garlic until the onion is softened and the kielbasa is browned. Add to a 4 quart slow cooker. Add the remaining ingredients. Stir. Cook on low 8-10 hours. *light or turkey kielbasa works fine here. One thing that happens when you make a gallon of sauerkraut is that you wonder how you are going to use it all. I had some on half smokes but now what? 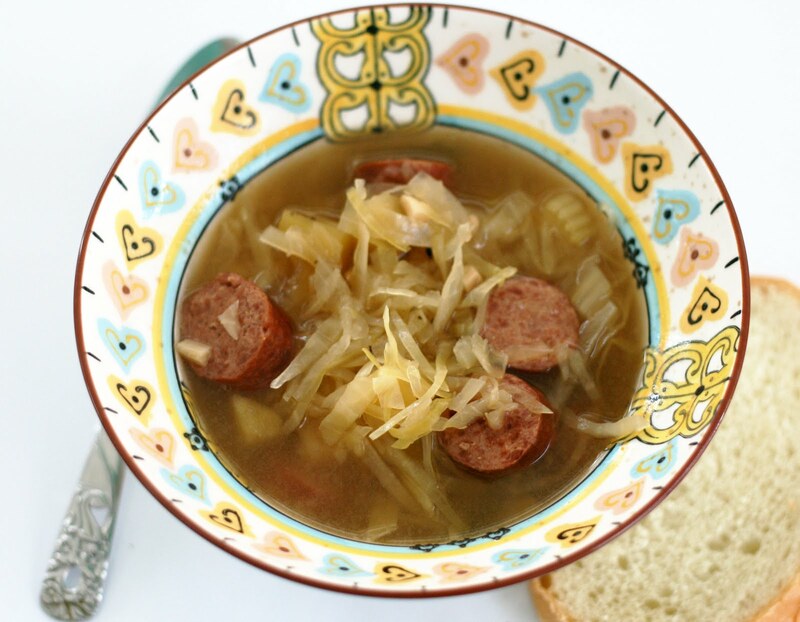 I had heard of sauerkraut soup before but never had it or made it. Now that I had a bunch of really tasty kraut and a few dreary days, I figured it was the time to try it. I decided to use the slow cooker because 1. I'm busy, 2. I was baking that day and didn't want to have to worry about dinner and 3. while dreary, it isn't really cold out so why stand over a stove stirring. One could make it on the stove though, just brown the onions, celery, garlic and sausage, add everything else and simmer until the sauerkraut is soft and everything is fully cooked. Maybe it is a little out-of-season but I figure if restaurants can feature soup year round so can I. As for the flavor, even if you if you are a sauerkraut lover, you will love it. It is homey, comforting and makes you think of your ancestors. Well, especially if your ancestors were Eastern European. The sauerkraut gets really soft (and homemade kraut is pretty crisp) and the soup is much less vinegary-salty than you'd think, it is sort more like a very fragrant cabbage soup. I can't think of a word that describes it better than unami. It isn't sour, it is just very, very savory. I thought this was going to be good but we loved, loved, loved this soup. We are not even soup people and literally ate all 4-ish quarts between the two of us in a single night. For the filling: Mix together the sauce and meat. Refrigerate 30 minutes or up to overnight. 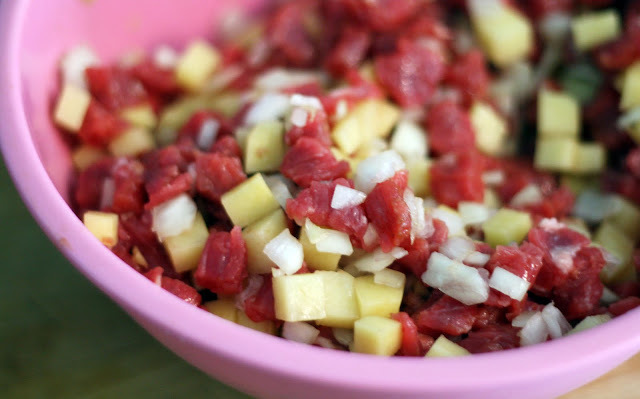 Add to a medium bowl, stir together the meat, onion and potatoes. Refrigerate until ready to use. For the dough: Place the pepper, butter, flour and cheddar into a food processor. Add water one tablespoon at a time and pulse just until mixture sticks together. 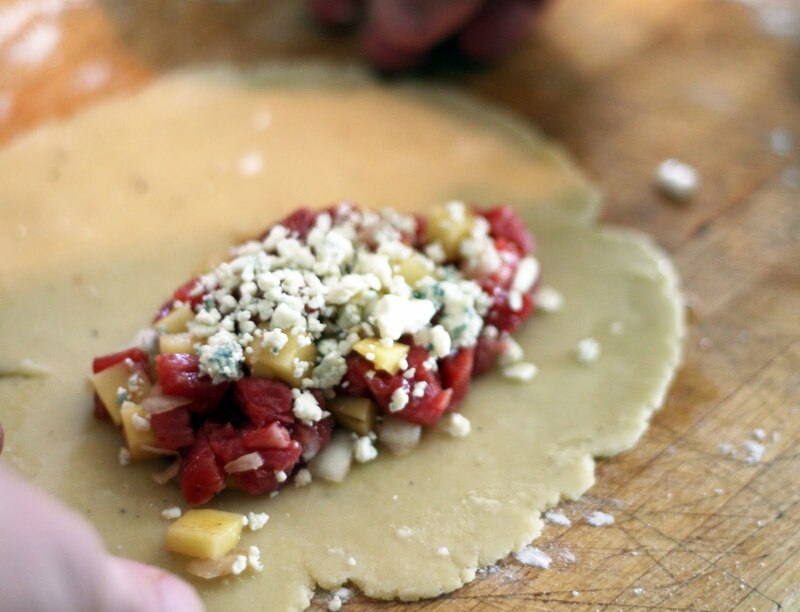 Divide the dough into 12 parts. Roll each out into a 6-8 inch round. Fill with 2-3 tablespoons of the meat filling (centered) and top with about 2 tablespoons of Stilton. Fold in half. Dampen the edge and crimp shut along the side, not the top! Brush with egg wash. Place on lined baking sheets and bake 60 minutes or until golden brown and cooked through. *aka HP Sauce. Look for it the British or International section of the supermarket. This in no way a traditional Cornish Pasty (a protected food!) 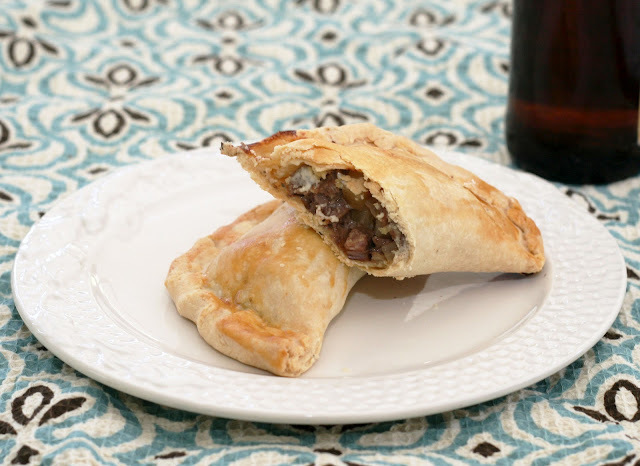 but my take on some of the pasty variations one can find at pasty shop (pastyeries?) around England.I made a dough with British cheddar (did you know that cheddar originated in Somerset, England?) and another protected food, Stilton (which always makes me think of Chef!) The result? A crispy, flaky hand pie with a robust, flavorful center. Perfect for lunch. I'm part of a small group of bloggers who will be posting regional dishes as part of Bravo's “Around the World in 80 Plates” premiering Wednesday May 9th at 10/9c. The show features chefs from all over the US racing through cities across the country and taking over restaurants to serve their version of the native cuisine. This week's show takes place in London. Check out their Facebook page and see pictures of what other bloggers are up to and to learn more about the show. I caught a preview of the first episode and it looks fun! Prep jars/lids for canning. Place the pluots into a large, heavy bottomed pan. Add the sugar, ginger, lemon juice, vinegar and thyme. (I just tied the thyme to the side of the pot with kitchen string) Bring to a boil, stirring and breaking up any big chunks (I used a potato masher) until it begins to reduce and thicken. Stir in the pectin. Continue cooking at a low (rolling) boil for 2-3 minutes or until it looks jammy. Discard the thyme. Fill the jars leaving 1/4 inch headroom. Process in the hot water bath for 10 minutes. To be honest, I bought these pluots because of their cute name. Dapple Dandy! We have a dapple dachshund so anything dapple catches my eye. Thankfully, they were also tasty. The best parts of plums and apricots. They were also very large (I've also seen this variety called Dinosaur pluots) and pretty firm-fleshed so they made wonderful jam. I know the title sounds like a mouthful but honestly, the ginger and balsamic only enhance the pluot's sweet-tartness. Brown the meat in a large nonstick skillet. Drain any excess fat. Add the onion and cook until onion is soft. Add all of the spices, tomatoes and stock. Bring to boil and cook until most of the liquid has evaporated, about 15 minutes. Serve on hard or soft taco shells. Top with goodness. This is how I remember eating tacos as a kid. Okay, if I wanted to be totally truthful, we normally use a packet mix and hard shell tacos but it didn't make sense to buy a packet when I had all of these spices at home and I can use the leftover flour tortillas for other things. I also probably wouldn't have avocado because it was never in the grocery stores when I was a kid. I don't think I had one until I was in college even. Now we can find pretty much anything! But back then, even the big stores were pretty limited produce-wise. But I digress. On the eve of what I think will be my busiest travel month ever (I am only home 12 days this month! I will be in California, Tennessee, Minnesota, Western Maryland and Maine for trips) I kind of wanted something comforting. I don't think I've had a ground beef taco for about 6 years or so. I kind of missed them. 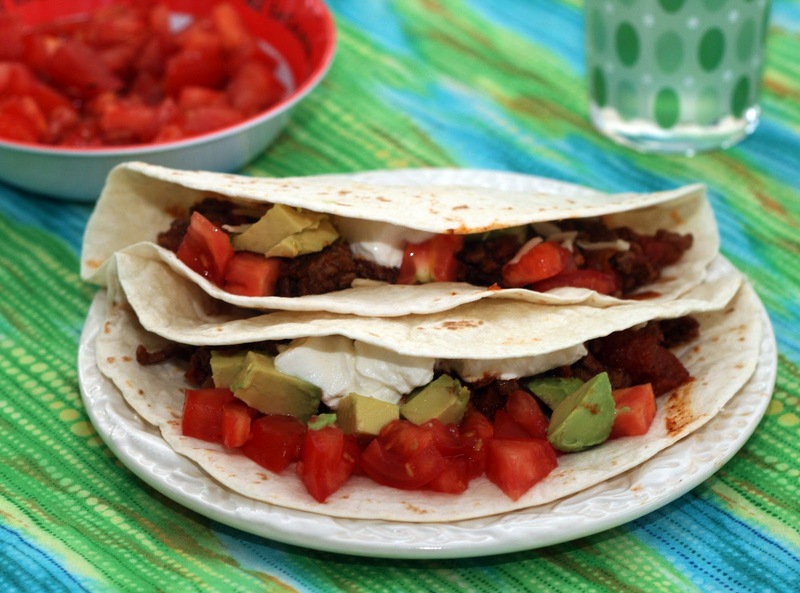 So if you want a recipe for homemade totally Americanized tacos, this is it. Resist the urge to gussy it up and use authentic Mexican cheese etc. Remember elementary school. But better. Note: You can leave out the canned tomatoes but it does add flavor and helps stretch out the meat a bit.